Missiles flying into the sky near international airport, in Damascus, Syria. On Monday, Netanyahu promised Israel would continue to act against Iran’s presence in Syria. Russian state media agency RIA-Novosti reported four Syrian soldiers were killed and another six wounded in the Israeli strikes, citing Russia’s defense control center. The London-based Syrian Observatory for Human Rights (SOHR) said 11 were killed in the strike, including 2 Syrian nationals. The SOHR described the Israeli attack as the “most intense and violent attack against the regime forces and their allies in terms of casualties since May 2018,” when Israel carried out a large-scale attack on Iranian targets in Syria following dozens of rockets launched from Syria toward Israel. Israel accused Iran of firing the rockets. 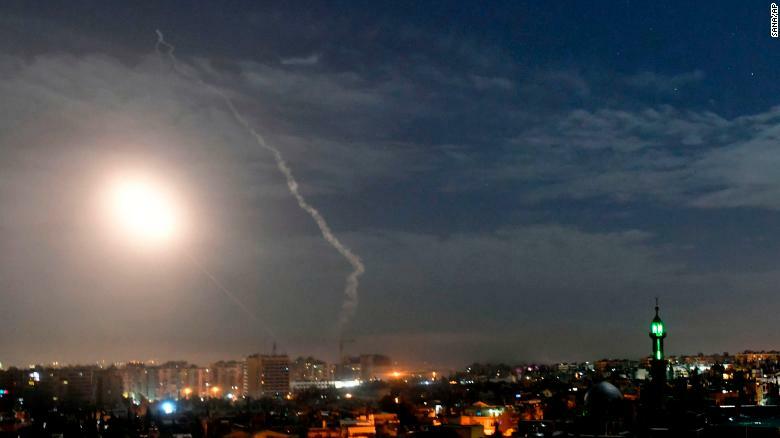 But Iran’s state-run FARS news agency denied that any casualties had taken place and reported that Syrian air defenses managed to intercept seven Israeli missiles fired into Syrian territory. Syrian air defenses destroyed more than 30 cruise missiles and guided air bombs in the course of repelling the attack, Russian state media reported. “The young people in the air force are fully ready and impatient to confront the Zionist regime and eliminate it from the Earth,” said Nasirzadeh, quoted by the Young Journalists Club, a website supervised by state television. Israel’s military remains on elevated alert in the north and the ski area in the Golan Heights has been closed, but there are no other restrictions on civilian movement, Conricus said.